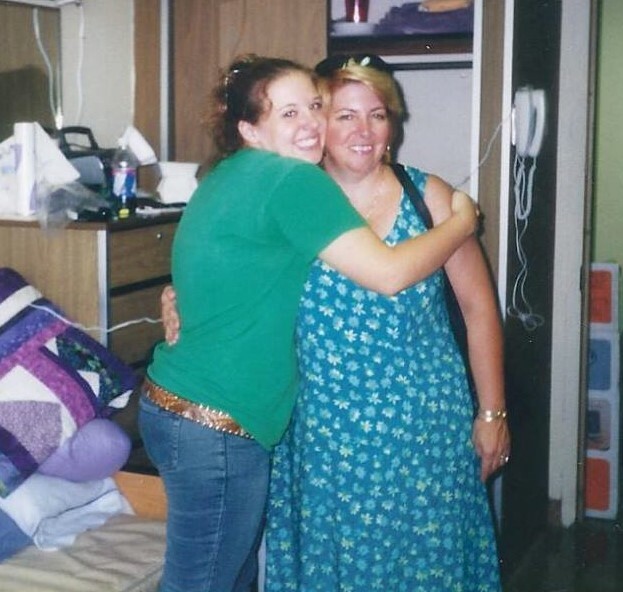 Taken August 2002: Freshman move-in day. Maureen Higgins passed away from cancer related to Li Fraumeni Syndrome on March 23, 2003 at the age of 18. She was diagnosed in November 2002 with stage 4 soft tissue sarcoma and quickly succumbed to the cancer after 5 short months. Maureen was a very special girl! She was always the life of the party and was always smiling. Her favorite saying was "Happy Day". You cannot help but smile every time you think of her. Mo, as we called her, had a personality that lit up a room. Maureen was very artistic and loved all types of the arts. Maureen applied and was accepted into the elementary art education program at Indiana University in Indiana, PA. Maureen was very proud to have been accepted into the program since it was a difficult program to get into. Maureen left for college in August and had been enjoying her time there. She was having some back pain issues and had been using the doctor's office at college with no relief. She came home for a visit in late October and did not look well. She was eventually diagnosed with Stage 4 soft tissue sarcoma in her adrenal gland and abdomen. We took her to Pittsburgh this time since they had facilities to handle her there better than Boston. She had surgery and a couple of rounds of chemo but nothing helped and she passed away in March. Maureen loved her sisters deeply. She was a twin with Eileen. Both Kerry and Eileen left college to spend time with Maureen. They all cherished that time together. Mo's older brother and sister also spent as much time as possible with her. Mo also had a good friend named Mike Nichols that also left school and came to spend time with Maureen. She was so very grateful for the company. She spent all of her days in a chair in the living room and would visit with her family and friends. Maureen was very generous with her money and would give her sisters all the money she was receiving from SSI due to her illness. She funded their first tattoos, which I did not know about! Maureen had the most amazing hair. It was thick and wavy and hung down to her lower back. When she had to do a senior project for community service in order to graduate from high school, she chose to donate her hair to Locks of Love. This organization uses the hair to make wigs for cancer patients. Little did we know, she herself would become a cancer patient. She video taped herself having about 14 inches of her hair cut off. Not without a few tears. But she felt it was the right choice for her. To try to explain just how special Mo was, I have to tell you a story that happened while she was sick. As Maureen started her chemo treatments, her hair started falling out. Instead of feeling sorry for herself, she asked if we could take her to the beauty salon and have the hair cut off and donated to Locks of Love again. Unfortunately, she never got to do it. Her hair fell out so fast that we did not have time to arrange for the donation. When Maureen passed away, Kerry had made some custom memorial cards for Mo. A group of Mo's friends came over and helped us to print and cut 19 different cards that Kerry had designed for Mo. Each one had a different saying that was something Maureen said or that spoke to us about Maureen. The cards were very popular with everyone that attended Maureen's funeral. The cards were talked about for years. About 3 years after Maureen passed Kerry and I (her mom) started an Internet based business making personalized memorial cards for the general public. We called it MoMorialCards.corn, A play on Maureen's nickname of MoMo. The company was #1 on Google search engine for about 4 years. We sent out tens of thousands of cards over the years. They were sent around the world. Kerry received hundreds of messages and emails from people thanking her for making the cards for them. They explained how the cards made the passing of their loved one a bit easier. Maureen would have been proud of Kerry and how she turned something so sad and tragic into a positive thing and helped people in the process. Kerry added a statement to every one of Maureen's cards the said "She was made to be remembered". It is so very true. It was just 12 years ago last week that we lost our precious Mo. It sometimes still feels like she was just here with us. Making us laugh or receiving one of her famous hugs. She always hugged you with her whole body and heart! You always felt so special after one of her hugs. One of my favorite pictures I have of Mo is the day we dropped her off at college. She was the happiest I had ever seen her and was looking forward to the adventure that awaited her as she started her college career. She was giving me one of her famous hugs. I often think about what Mo would have been like as an adult. She would have been one of her school’s most favorite art teachers. I imagine all the kids would have loved her. She would have made a terrific mother! She had a heart of gold and would have made the best mom. The world was a better place because Mo shared her 18 years with us! I miss her with all my heart and will use this life celebration to honor her memory and keep a smile on my face all day!